It's August 1991. The Super NES is on the way. What's Dr. Wily doing in that mech? Getting revenge, that's what. Here's the greatest image in the history of NP's letter section. What happened to young Christopher Police? Hopefully he didn't spontaneously combust when he got a SUPER NES in the future. As for when he eventually got a Nintendo 64... well, I'm not saying he 's responsible for global warming, but I wouldn't rule it out. This review is amazing, with story and artwork and "epic" all over it. Heck, this DEFINES epic. 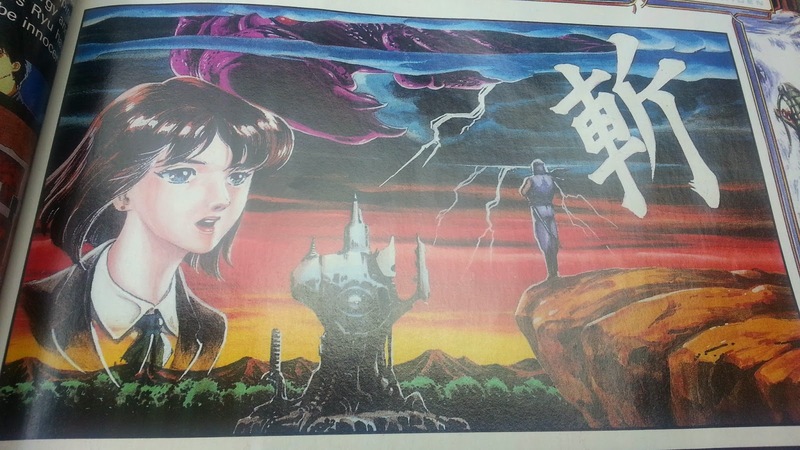 I mean, look at this artwork! This looks like roughly the coolest story concept on the face of the planet. There's some modern-day technology/costuming surrounded by mysticism and armageddon overtones. Note the apocalyptic sky behind the Castle Rock Fortress. The weird prongs coming off of Irene. What the hell is that giant shape emerging from the sky? Is that the Ancient Ship of Doom from the title of the game? I MUST PLAY THIS. ...well, I have played this. But at the time that I first read this issue, my actually playing it was far in the future. 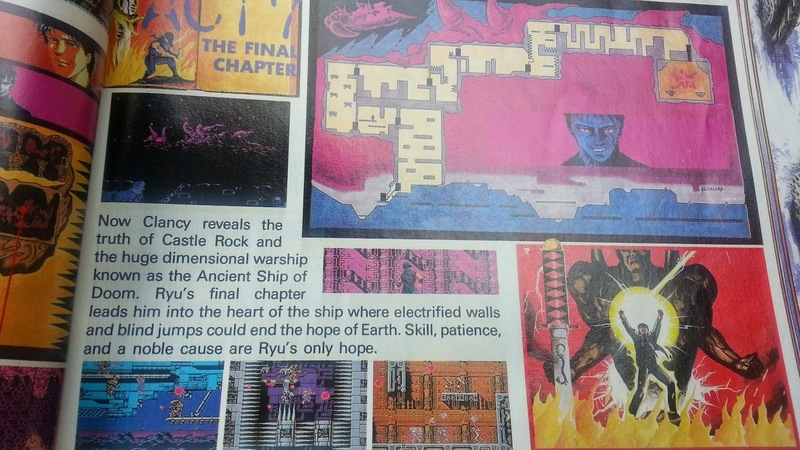 I was very intrigued by this section on the final level, the culmination of the story where everything would be explained. Classified Information. It's...so classic. 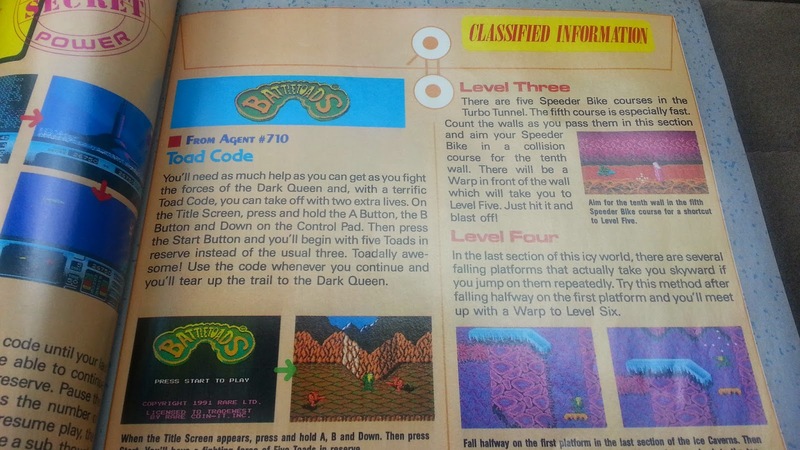 Caution: Inputting the "Toad Code" may cause blood to rain from the sky. Finally, we arrive at the Dragon Warrior III coverage. This is especially useful for me since I'm about to start the game. 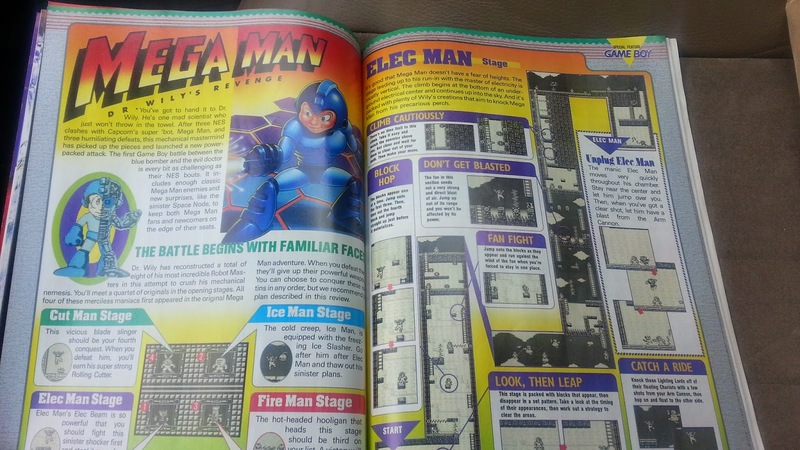 On this page, Nintendo Power goes the extra mile by talking about the entire trilogy. 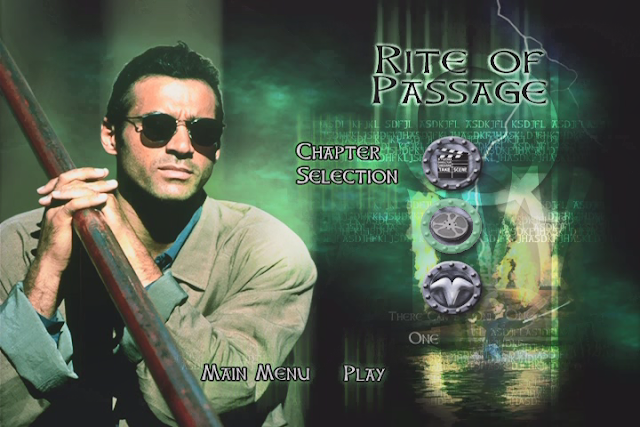 Back then, RPGs needed a bit of a push to grab the attention of the game-playing public, and NP played a part in that. 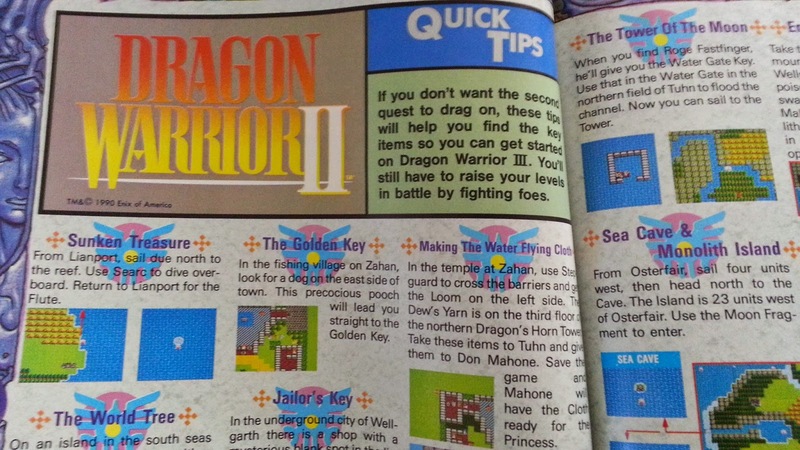 Dragon Warrior II coverage is a curious addition. 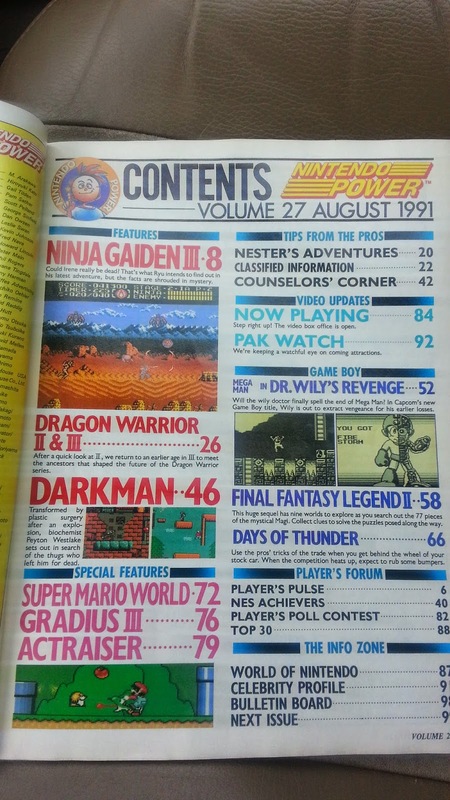 Back then, Nintendo Power would often go back and cover games that had been out for a while in more depth than they had originally. 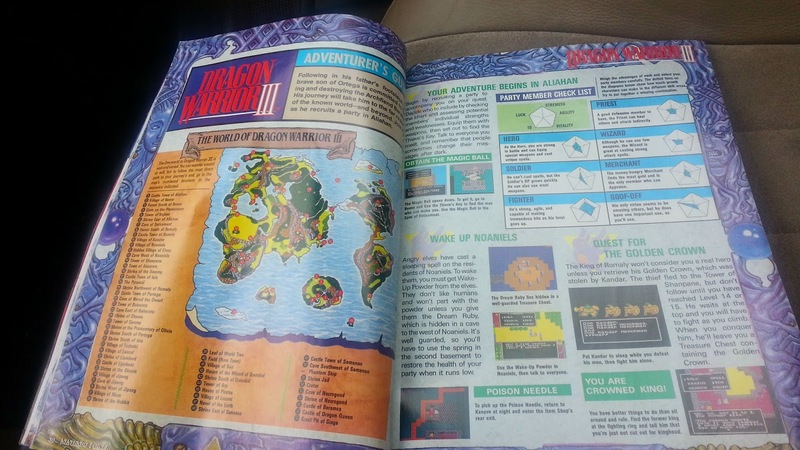 For instance, they gave a huge map-filled extravaganza to the original Metroid a couple issues after this, despite that it had been out for several years already. Later, NP would become more focused on things that just came out, but they'd still revisit games from time-to-time. 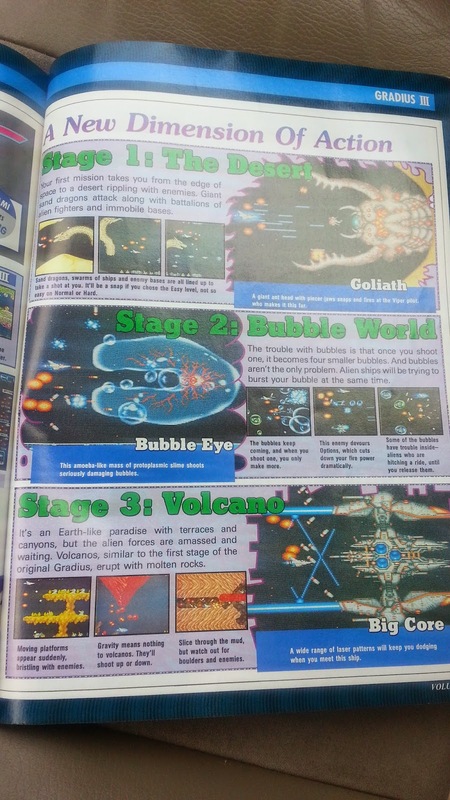 Like their amazing second look at Secret of Mana, which spanned three issues. Unfortunately, by the N64 years, it seemed like they no longer revisited old stuff. With the exception of Pokemon, everything new got covered/hyped when it was on the way / new, then sorta set aside. The world of Dragon Warrior III... is OUR WORLD. Gasp! This was a revelation at the time, I imagine. The world of the first two games is essentially just our world's hell. Or something. The class chart is kind of weird and makes Fighter look vastly more powerful than the rest. That might actually be true if you're looking at things from a pure stat number standpoint, but NP got a lot wrong so who knows. 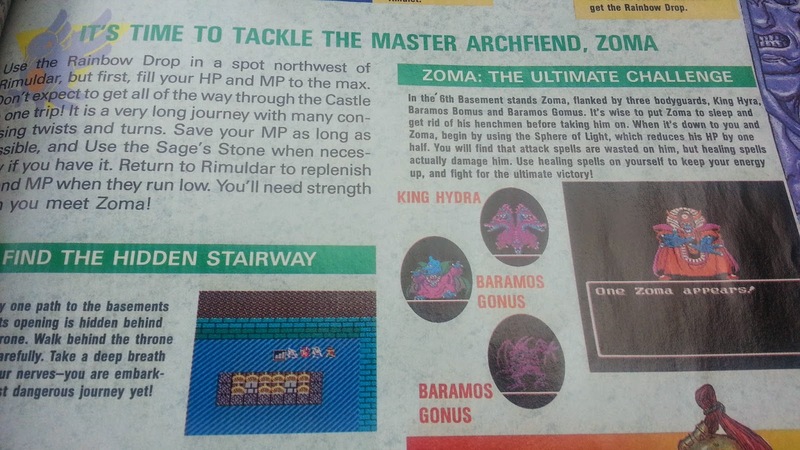 ...for instance, they suggest that you put Zoma to sleep and fight the other bosses first, as if they all attack at once or something. ...and as if sleep would work on Zoma. Zoma may be the ultimate challenge, but those Baramos clones always intrigued me when reading this issue. This was another game that NP got me interested in way before I ever played it. Counselor's Corner - in addition to pictures of Game Counselors that are too awkward to print here - features maps for getting through the infamous Cave to Rhone in DWII. Giving away the locations of the pits is a particularly big help. 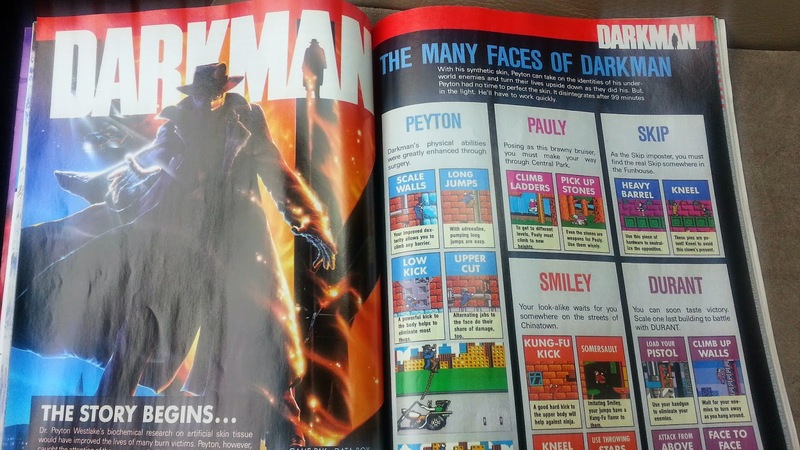 Perhaps the weak link of the issue is Darkman, but they even made THIS game look fascinating by explaining the various powers you can use from level to level. THIS ISN'T WHAT CENTRAL PARK LOOKS LIKE! 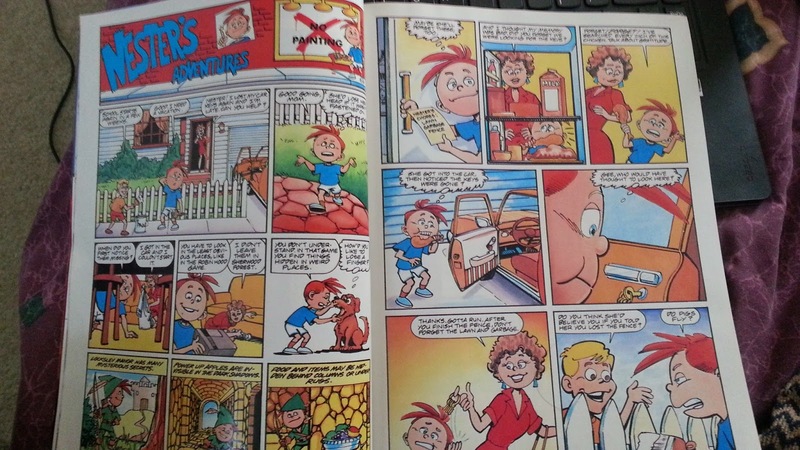 Before Mario comics and Zelda comics... there were Nester comics. They're generally a page or two long and cover the hilarious misadventures of a kid who wants to play games BUT HE HAS TO DO CHORES. ...at least, I think that's what this comic is about. 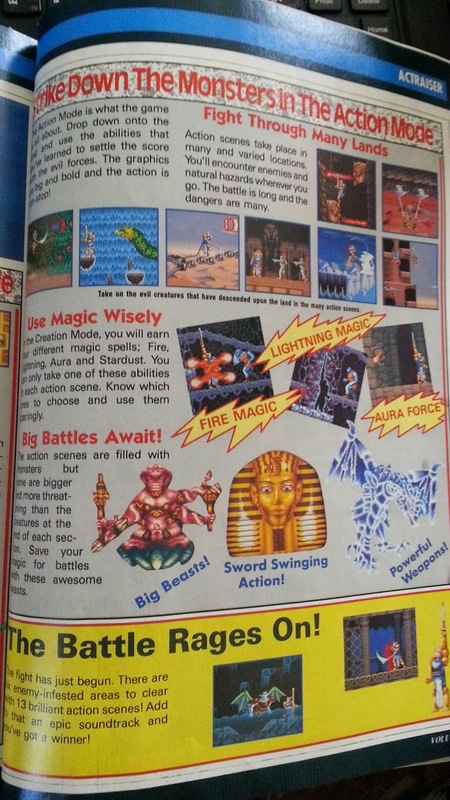 Game Boy has its own special section, and this month it's a doozy. 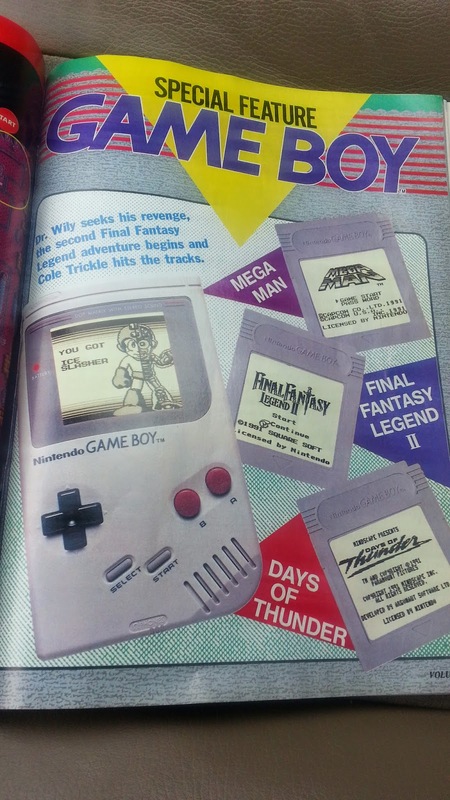 I like how they include a full-sized Game Boy picture just because it looks awesome. ...though the screen is way too clear. Seriously, playing on the old Game Boy and clearly seeing what you were doing... it was NOT easy. Dr. Wily's Revenge is a classic. 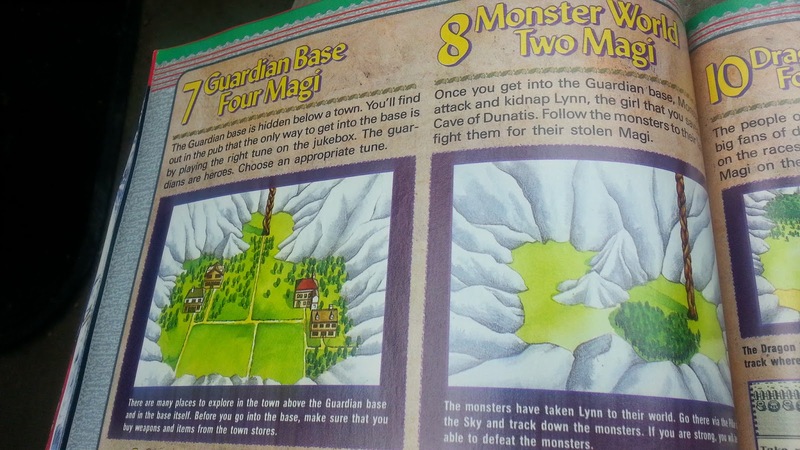 I don't know how necessary maps actually are for hallway-based action games, but it sure was fun to study these maps as a kid in lieu of having the game. The captions really flesh out what's going on in the stages. Moving on, here's Final Fantasy Legend II. 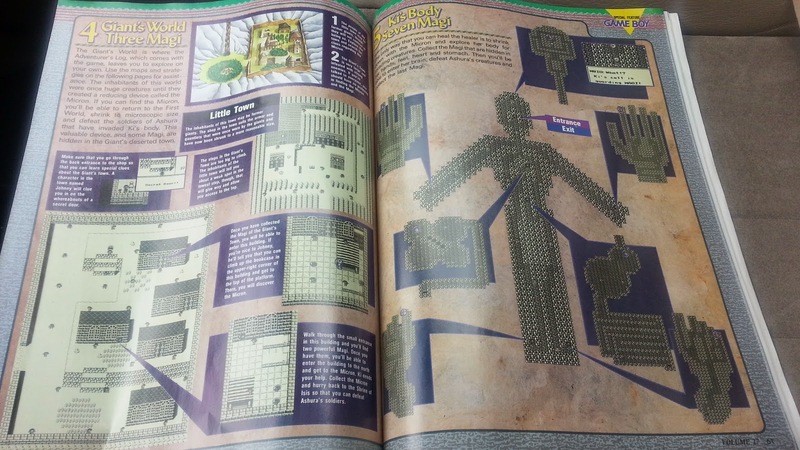 Specifically, a map of the level where you shrink down and go inside of a goddess... via nether-regions. No, that really happens. SUPER MARIO WORLD PREVIEW. This game is so bright and colorful that even the name itself is multichromatic. Unless they own a Wii-U (lawl), nowadays all kids have to look at are dull colorless games like The Last of Us and whatever Call of Duty came out this month. The world map. This world map is pretty much burned into my memory. 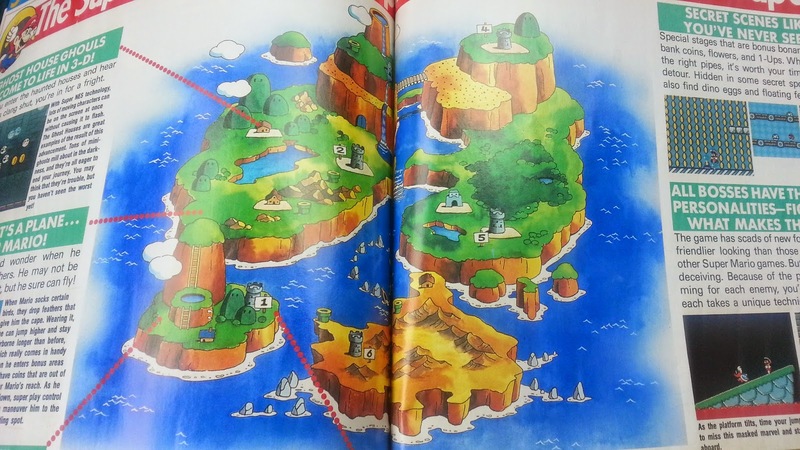 I wonder if the Ghost Ship was supposed to be World 7 and the Valley of Bowser World 8, but they ran out of time. It's pretty weird that World 7 is the end and has two castles. A NEW DIMENSION OF ACTION awaits with Gradius III. I talked about this issue during my post on that game. 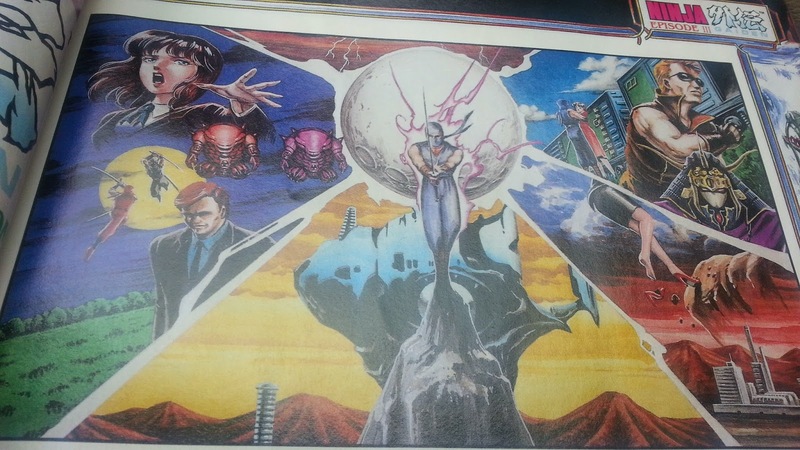 I like the way it emphasizes the huge, impressive bosses front-and-center. Actraiser was one of my favorite early SNES games. This preview puts the impressive bosses on display. 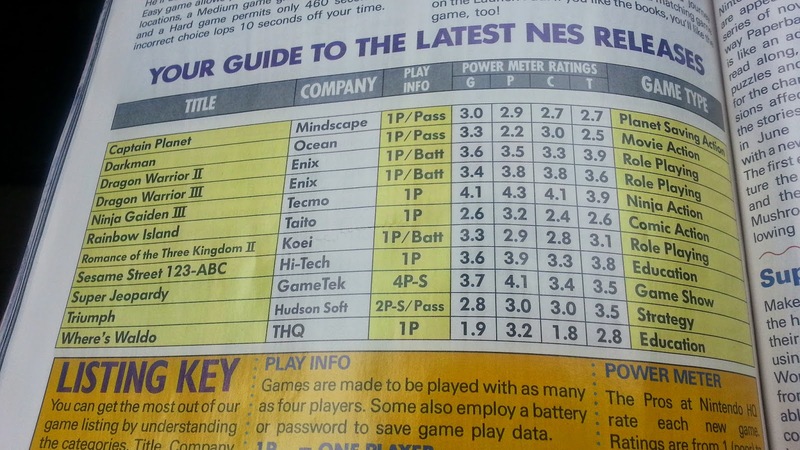 Here's the ratings page, which always seemed really suspect to me. For one thing, later on almost no games got scores lower than 3 (out of 5). Ever. 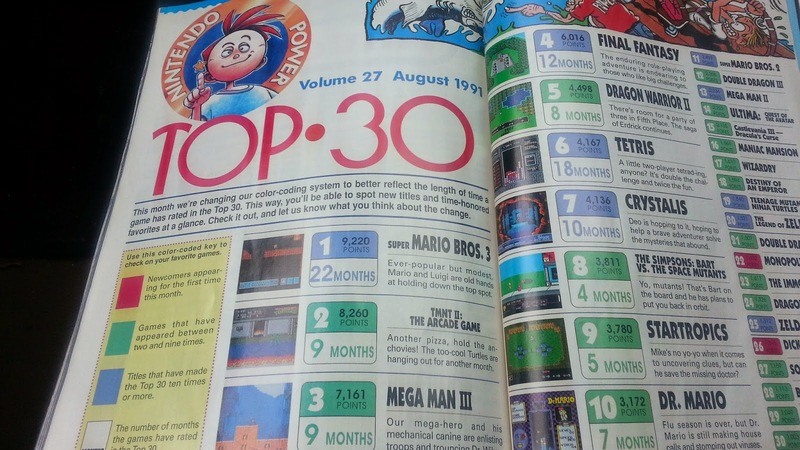 Here we've got a couple, but during the SNES years it was like they weren't allowed to go below 3. 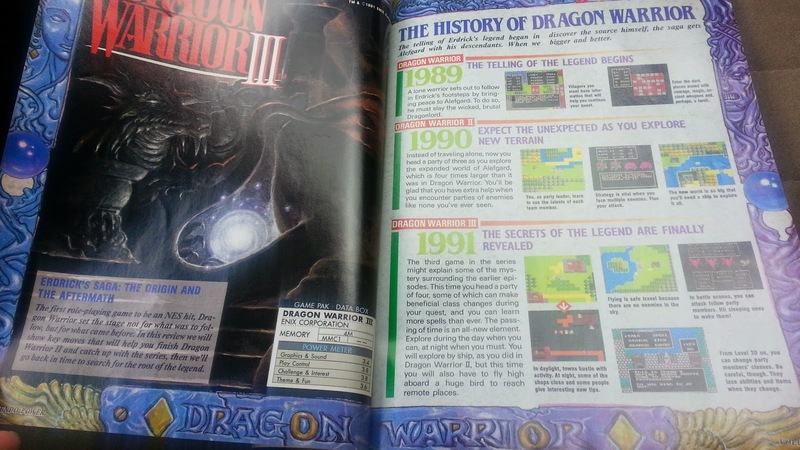 How Dragon Warrior II and III are so evenly-matched is beyond me. III wins on challenge and fun, while II wins on graphics and controls? Seriously? They should be even on controls, with III winning on graphics and fun and II winning on challenge. In other words...they got everything backwards. The Top 30 is exclusively NES games at this point. Soon after it'd expand to include NES and Game Boy games, each with a separate section. 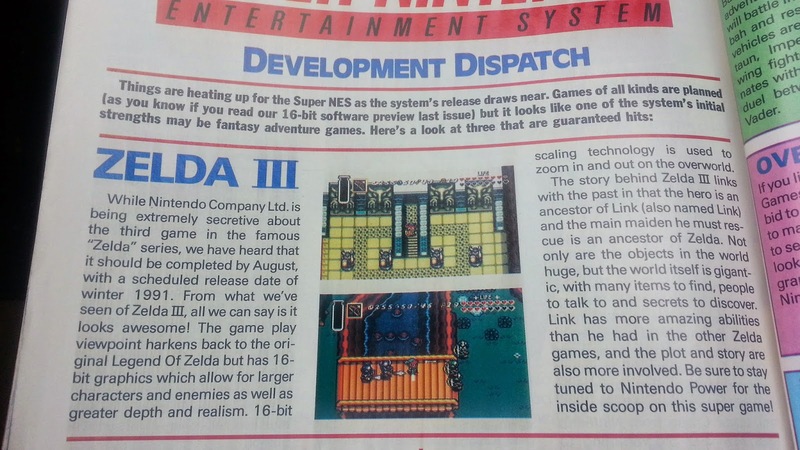 ZELDA III is on the way. This was an exciting time for kids that grew up with the NES. 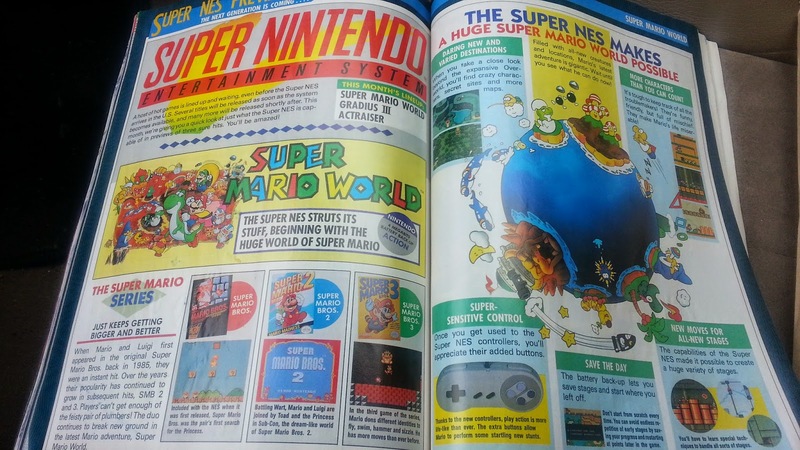 Mario and Zelda accompanying a new system (one at launch, one a year or two in) is a pattern that has continued ever since. 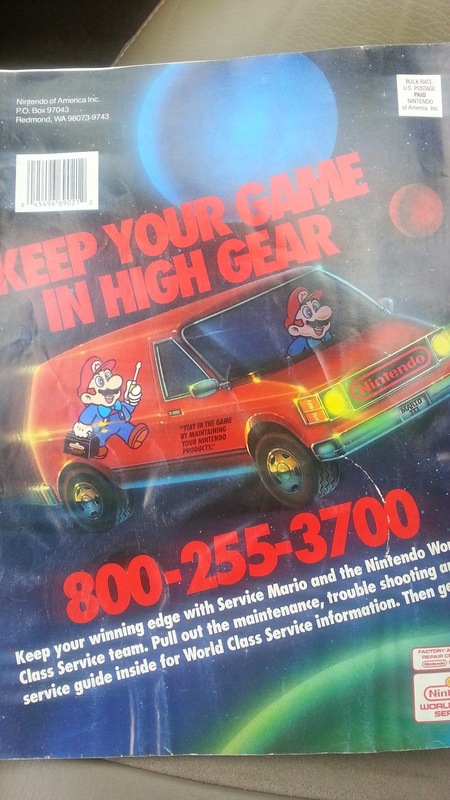 I actually remember calling this number quite a bit as a kid for one reason or another. 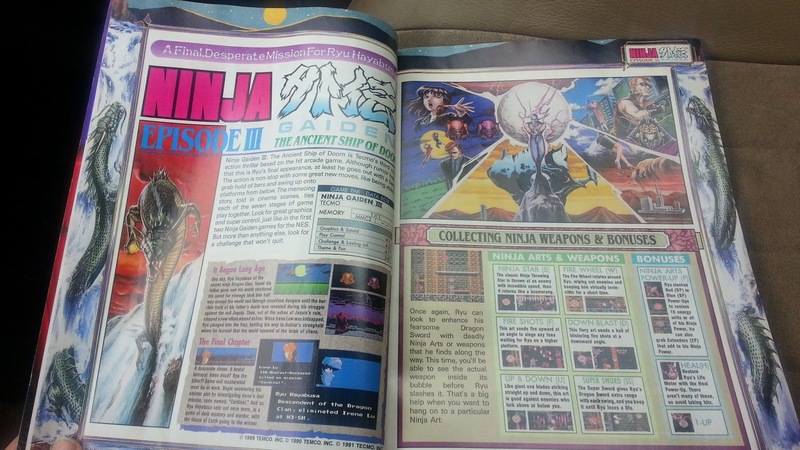 My thoughts on modern game magazines that aren't Nintendo Power. 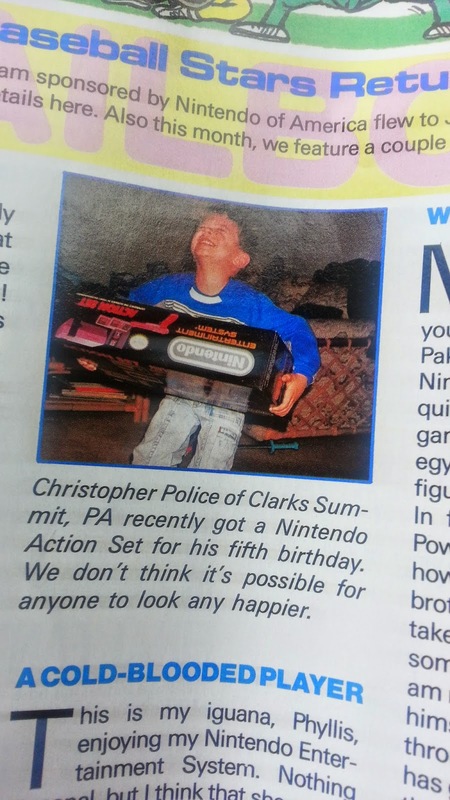 That kid was one of the ones who got their first console late in the NES life but still pre-SNES. Like me. 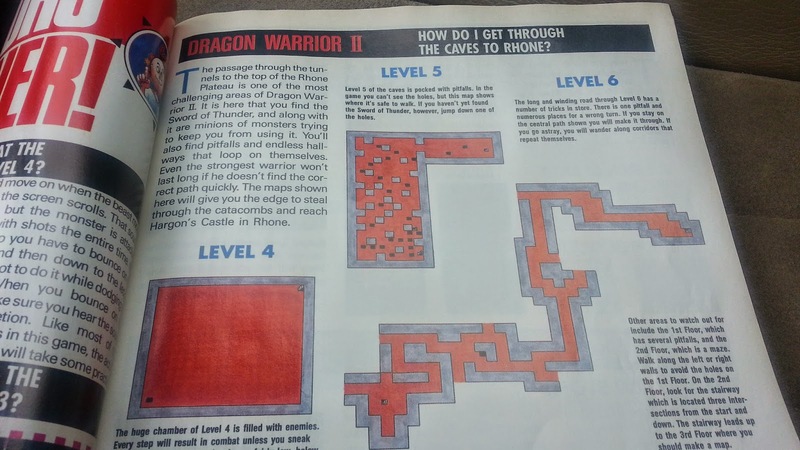 That Dragon Warrior 3 coverage was so good, and this particular issue definitely helped me to beat both DW2 and DW3. I have to get this issue back. This is top-quality stuff. I'm hesitant to say the peak of the magazine, but absolutely the best they could've done with what they had. Real love of gaming and desire to give kids the feeling of adventure comes through. All that brightness can really help those of us who lived in drab places. 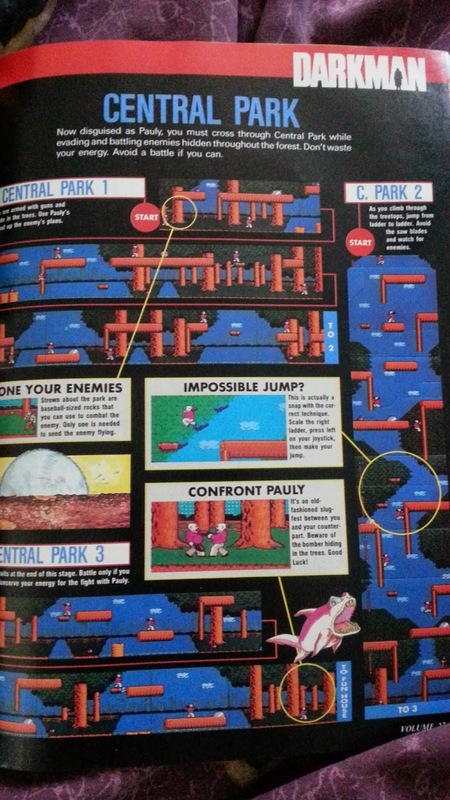 The Nester comics usually contained tips for particular games. 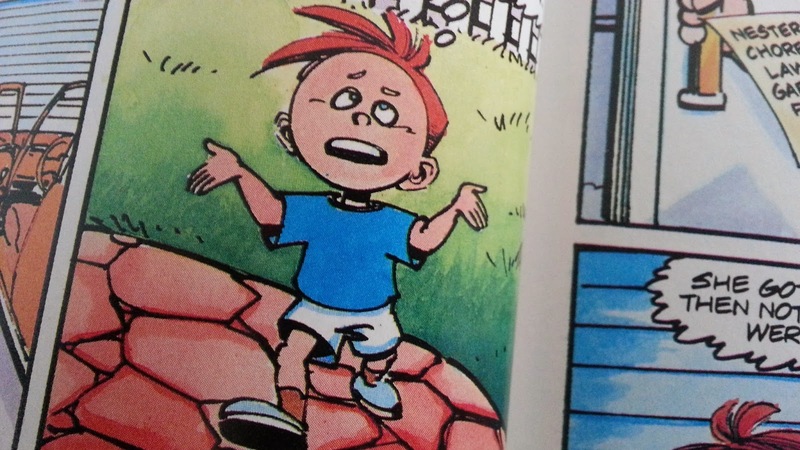 I liked Nester's 'tude! This was the Bart Simpson era, remember. I'm not sure if NP had a peak. I've never seen the first 20 issues, but I know it was REALLY good from 23 to 38 or so. That was during the SNES hype era and the early SNES era. It was still good from 38 onwards, but I think it was most fun during those issues. Very hard to say if it's the peak though. The 50's and some of the 60's were very, very good too. The magazine didn't even start to decline until 1995, which was the late 60's through 70's. Awesome post. 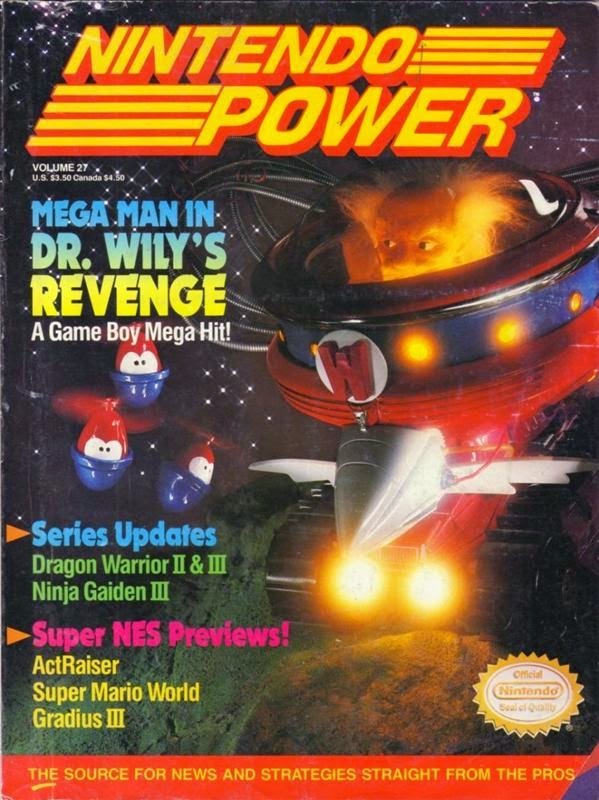 I think this was the peak of the magazine, but that might be nostalgia talking.